One candle will be dressed, blessed and lit on your behalf on his feast day of JANUARY 14th. Offerings will be preapred and an altar set for this holy day. *** YOU MUST TYPE YOUR PETITION ON YOUR ORDER FORM IN THE "SPECIAL INSTRUCTIONS" AREA!!! I WILL NOT ACCEPT SEPARATE OR LATE PETITIONS. sprinkling water upon the ground. He is sometimes accompanied by a black dog or a rooster. importance for it is choice that displays the maturity of the heart and mind. 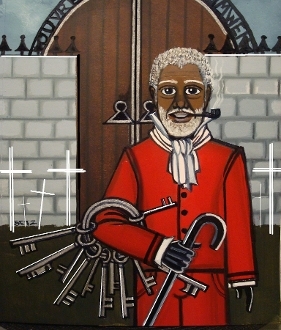 He is an honored Orisha called Elegba in the Ifa and Santeria traditions. and talents such as dance ability, more luck in gambling and better skill on guitar.